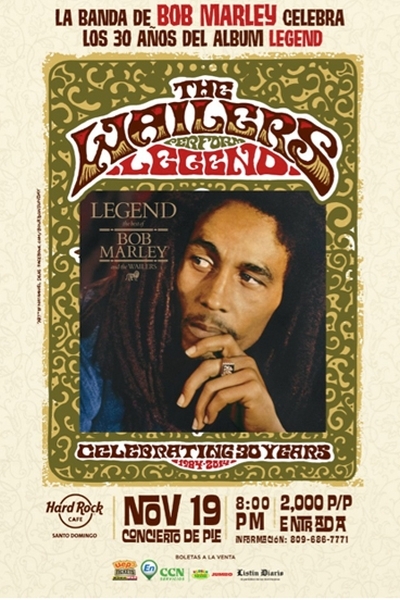 The Wailers will be celebrating 30 Years since the Bob Marley and The Wailers album “Legend” was made. The Wailers formed their own group in 1981 after the death of Bob Marley. They still play Jamaica’s reggae tradition at its best. The Wailers live concert tour has been traveling around the globe with this much anticipated concert to sell-out crowds. The anchor of the band is bass player Aston “Family Man” Barrett who played with Marley and many other greats. They bring joy and positive vibrations to every town they visit. The celebration will be at The Hard Rock Café Santo Domingo November 19, 2014 starting at 9PM. RD$2000 p/p entrance. Events bob marley, concert, hard rock cafe, hard rock cafe santo domingo, reggae, the wailers. permalink.